Meet the first hand-built luxury human-electric bike, the M55! Mountain bikers from Budapest have spend the last four years making this bike. Only 55 of these will be built with the most up to date technology. The bike sports a CNC-machined aluminium frame and carbon fiber plates. It has a formula one stopping power with a brushless electric motor that makes uphill climbs a breeze. The bike is built on a 19-inch frame to which a Fox fork and a rear suspension are added. The Beast 55 offers electic powered assistance only during active pedaling. The bike has a 1900W EB-PC brushless electric motor that has a rated torque of 32Nm. The M55 says that it can reach a maximum speed of 77kph (47.8mph) at 120rpm pedal cadence. It houses a 44v Tenery Li-Polymer battery pack rated at 20mAh will power the motor for about 44 km (27 miles). 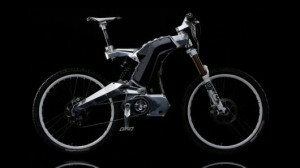 In ECO mode the bike would run for 100-120 Km (62-75 miles) on a single charge. If the battery dies mid-journey, the bike just looses electric assist and the rider can complete the trip on pedal power only. Limited Edition CF8 Bikes from Colnago and Ferrari Team up! Want To Fight Child Obesity? How about a Pedal Powered School Bus!